Education is not a luxury, but a basic right. We, at Indian Centre for Development and Rights strive to make education accessible to everyone irrespective of their social or financial background. 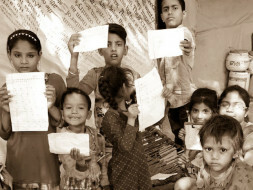 As per census, 8.4 crore children in India are still denied their right to education. Providing quality education to the youth of India is the first step that we, as a society, need to take to reduce the poverty in our country. We, at iCFDR, are providing free education to the children belonging to the underprivileged section of the society through our Easy Classes. The initiative is to help these children gain basic knowledge and to learn basic skill which can elevate them psychologically, mentally, physically emotionally to fit them into today's modern world so that they can make place among millions in the world. Our mission is to improve quality of their lives which in turn help them to face any kind of financial and emotional crisis they encounter. Help us in our endeavor in bringing, joy, peace and prosperity in the lives of the deprived of the streets facing enormous challenges but who have the zeal to learn. Out of every rupee that is donated, 90 percent shall go towards project expenses like stationery, classroom management, volunteer allowance etc. and 10 percent shall go towards the operational and management expenses of the iCFDR. Lets all walk in solidarity to spread joy in their lives by contributing a small fraction of income and make a change worth enduring.